With high school graduation ceremonies beginning soon, and students contemplating their next steps, now is a good time to look back at the Class of 2013 to see how prepared they were for their first year of college in Alabama. We have only one real, publicly-available measure that allows that view: remediation rates. The Alabama Commission on Higher Education (ACHE) produces reports showing how many of Alabama’s high school graduates who are enrolled in Alabama’s public colleges, two- and four-year, and were also enrolled in a remedial class in math, English, or both during their first semester. 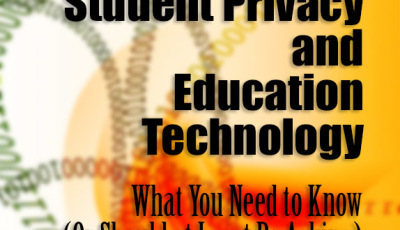 Students who are enrolled in colleges outside of Alabama are not included in these measures. In March, we looked at the Class of 2012. Now we’ll look at the Class of 2013. Statewide, 31.8% of Alabama’s high school graduates in the class of 2013 who enrolled in Alabama’s public colleges were enrolled in remedial classes in math, English or both during the Fall 2013 college semester. Total Number of Graduates at the High School: Total number of students who graduated from the high school in 2013. Enrolled in Alabama Public College: 2012-2013 High School Graduates enrolled Fall Term 2013 at one or more public colleges in Alabama. Here’s where it gets interesting. And a bit difficult to view and manage. The embedded documents below only allow you a brief look at the data and they are difficult to manipulate. Your best bet is to work within Google Docs. Use the “Get the Data” link for each spreadsheet below, then download it to your computer. The arrows at the top of each column allow you to sort to your heart’s content. There are three spreadsheets here for you to manipulate and search for this information. 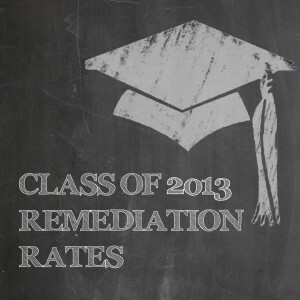 Table 1 is a list of every high school, broken down by 2- and 4-year attendee remediation rates. 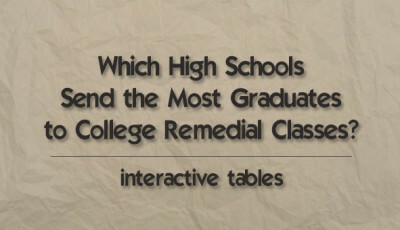 Table 2 is a list of every high school’s total remediation rate, not broken down by which type, 2- or 4-year, college they attend. 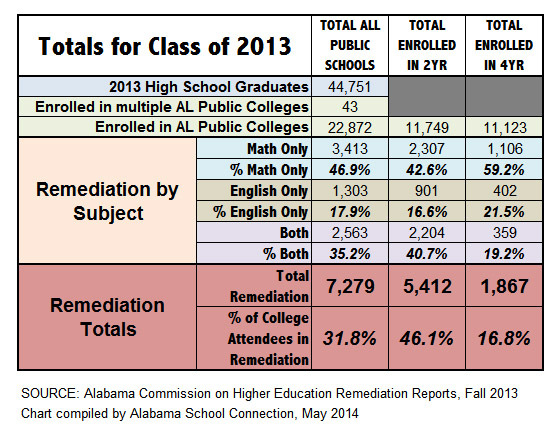 Table 3 is a list of all Alabama school districts showing the district’s total remediation rate. CORRECTION 05/26/14: Dothan City’s totals were not calculated correctly. There were two sets of numbers instead of one. The numbers have been corrected to reflect total numbers for the district. Apologies for the error. Once again, it’s late as I write this. No room for interpretation tonight. Download the spreadsheets, find the remediation rates for your schools and your district. Ask your school officials what is being done specifically to improve college readiness. Ask your school officials what their goals are, number-wise, through the years. Share this information with your board members. Share this information with your local media. Ask them to help you ask the tough questions. Post your questions here or on the Facebook page. NOTE: In order to adhere to data guidelines from the State Department of Education regarding cell sizes (when the total is less than ten, the data is considered “identifiable” and thus not included), the following high schools were removed from this report: Chickasaw City High School, Continuous Learning Center, Cullman Child Development Center, Lawrence County Developmental, Montgomery Technical Education Center, and Paint Rock Valley High School. Therefore, a total of 23 graduates from these six high schools were not include in the report from ACHE. The secondary system faces similar questions and challenges. The research and empirical data accumulated by the adult learning community could offer insights in to possible policies and programs that have promise for the secondary system in Alabama. The National Center for Developmental Education and The National Association for Developmental Education have extensive experience in policy development and programs that work for post-secondary education in the United States. It has been my observation that sound policies and good teaching principles are remarkably similar for all levels of education. With this fundamental premise stated, I would suggest that we could start with the general statements outlined below to guide us in the development of sound policies to guide program development and assessment in remedial education. Principle 1. Identify baseline performance before implementing mandates. It is essential to identify how well the programs or courses being changed are performing now. Otherwise, it will be impossible to determine whether or not the changes are actually resulting in improvement. Principle 2. Identify what is already working well. Some programs and techniques are already successful. Their impact, however, is obscured when statewide data is aggregated. Before making major statewide changes, make sure that institutions and programs that are already working well are not compromised by mandated changes. Principle 3. Pilot innovations before mandating them. Wherever possible, innovations should be piloted on a small scale before being mandated on a large scale. Not all innovations can be generalized to all institutions. Each should be subjected to a pilot study to determine the conditions necessary for success before they are implemented on a broad scale. Principle 4. Allow for local flexibility in implementation. All institutions in your state have different cultures, resources, students, faculty, staff, and missions. Different institutions should be permitted to implement innovations with appropriate modifications based on local circumstances. Principle 5. Provide for professional development. Most of the available innovations in developmental education require training in order to implement properly. Make sure that funding and other support for professional development is included in the implementation plan. Principle 6. Recognize that there are no simple solutions. 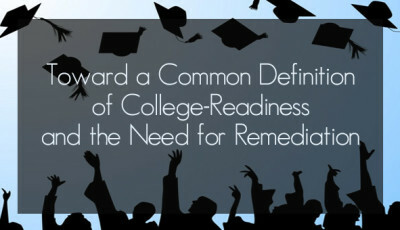 The reasons for student under preparedness are many and complex. There is no single solution that will address them all. Multiple approaches should be encouraged and supported in order to accommodate a variety of student problems and issues. Principle 7. Involve those who will be implementing innovation in planning. No matter what is being mandated, faculty and staff at local institutions will have to do the actual work of implementation. These professionals should be involved in advisory roles to identify barriers to implementation and actions necessary to overcome them. Principle 8. Identify the impact of innovation on minorities and the poor. Not all innovations work well for everyone. Innovations will have differing impacts on different groups. Because minorities and the poor are overrepresented among the underprepared, the impact of innovations on these groups must be considered carefully. Principle 9. Include an evaluation plan. Not all innovations are going to work as expected. A statewide plan for evaluating the impact of innovations should be developed at the outset to determine whether or not the mandated innovations are having the desired effect on student performance. With these general statewide policy statements articulated, I will offer future posts that discuss specific remedial education programs (focused on secondary education) that have proven successful in other states. 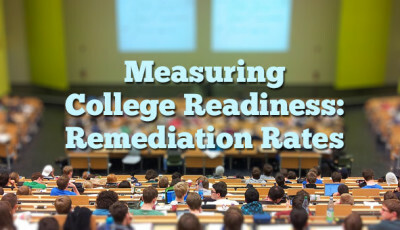 Dan, please forgive the lateness of my reply to your thoughtful, insightful, and straightforward suggestions to evaluate policy solutions to lowering remediation rates in our 2- and 4- year colleges. We must figure a way to get you and these principles to the table in addressing this challenge. In the time since I published this post, I have had many discussions with folks who see the problems but haven't quite figured out how to solve them. Thank you so much for sharing these principles. Sound policy development at any level is key to finding lasting solutions.